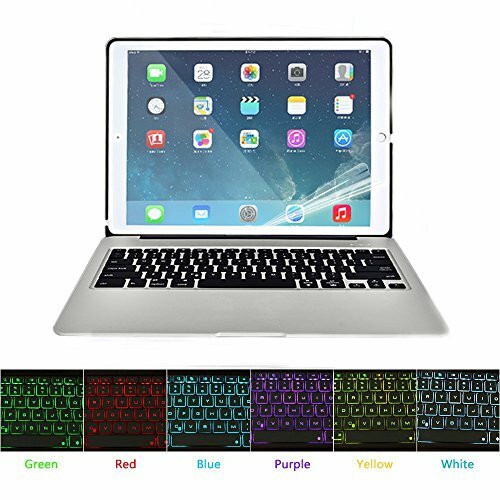 HIOTECH iPad Mini 4 Bluetooth Keyboard Case Make Your iPad Mini 4 Instantly Become Laptop! Perfect Design for Business & Travelling! Please pruchase by HTIOTECH brand. Other brand in our Store will Not Responsible for the After-sale. 1. The angle of between keyboard and iPad Mini 4 should LESS THAN 10°. 2. Gently press the sides of the iPad by thumb, make sure the iPad is well seated into the shell slot. 1. Constantly press the "Push" button. 2. Gently push the round hole from the back of the protective shell, take out the iPad safely. 1. Open the keyboard cover, move the switch to "On" position, then capital indicator and Bluetooth indicator display white and blue color respectively, after 3 seconds will automatically go out. 2. Close the keyoard cover, and move the switch to "Off" position, then enterin into sleep mode. 4. Charging Time: <3 hours. More Details Please Read User Manual! TOTALLY ALUMINUM ALLOY KEYBOARD COVER: Made of high standard aluminum alloy material, totally alloy bluetooth keyboard cover. Special function keys help you get more done from the convenience of your keyboard. SEVEN COLOR LED BACKLIT KEYS: Seven color backlighting design, support different brightness control, bring you different enjoyment. POWERFUL CAPACITY POWER BANK: With 2800mah capacity power bank, can charge for your mobile phones, tablets and other devices. ULTRA SLIM & PORTABLE: Clamshell type of design, the thickness of key only 4mm, super convenient to carry.